Additional Materials: 150-250 Size 6 seen beads in contrasting color for hatband. Casual and comfortable, the Demi-Brim Felted Hat is a quick and easy knit. 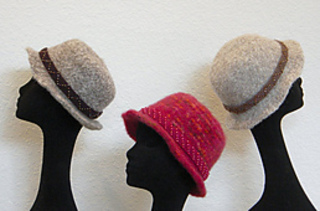 Customized looks can be achieved with a matching hatband made with sport weight yarn. Two beaded styles and one elongated stitch pattern are included.